This transparent mascara contains Provitamin B5 to strengthen your lashes and Vitamin E to moisturize and stimulate growth. 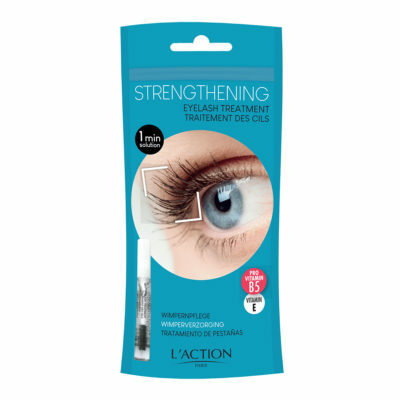 The eyelash treatment also cares for your lashes on a daily basis: the structure gradually lengthens and thickens, while your lashes stay silky soft and perfectly curled all day long. Transparent mascara can be used on its own or under your usual mascara and is ideal for damaged lashes. AQUA (WATER), PVP, PROPYLENE GLYCOL, POLYSORBATE 20, TRIETHANOLAMINE, CARBOMER, PANTHENOL, PHENOXYETHANOL, AMINOMETHYL PROPANEDIOL, TOCOPHERYL ACETATE, METHYLPARABEN, PROPYLPARABEN, ETHYLPARABEN. Apply on untreated clean lashes. Leave to dry. Then apply your usual mascara.